A triple-purpose variety! 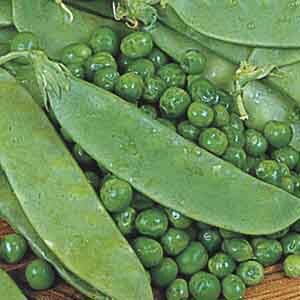 Can be used as a Snow Pea (pod and all) when young, as a Snap Pea, or regular Shell Pea when mature. A must for every vegetable garden. Superb for eating fresh or added to a variety of dishes. Delicious when boiled or stir-fried. Delicious when lightly steamed and covered with cheese sauce or melted butter. Wash fruits, vegetables and herbs thoroughly before eating. Plant in well-drained soil as soon as it can be worked. Keep soil moist, watering freely in dry weather. Fertilize regularly. Harvest as needed.